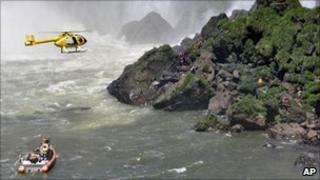 Two US tourists have died in an accident at Iguazu Falls on the border between Brazil and Argentina. They were in an inflatable boat which capsized after apparently hitting rocks near the base of the waterfall, Argentine officials said. At least five others were rescued from the water but suffered injuries. The spectacular waterfalls at Iguazu are a major tourist attraction, and every day hundreds of people take short boat trips to their base. The Associated Press named the two victims as Laura Matejik Eberts, 25, and Philip Musgrove, 70. The injured included two Germans, one American, one Colombian and one Argentine. Several police launches and a helicopter joined the rescue effort and the search for bodies. "it has been more than 10 years since we had an accident of this kind," Argentine National Parks official Daniel Costra told local media. The waterfall complex at Iguazu consists of 275 separate waterfalls along a 3km (two-mile) stretch of the Iguazu river.